Many governmental benefit programs are unwieldy, have difficult-to-understand processes and almost invariably bring incomprehensible delays. The workers’ compensation program, though, is designed to provide needed financial relief to injured workers quickly and efficiently. Workers’ compensation benefits, however, come with limitations. They generally only provide compensation for lost wages and medical expenses. Workers’ compensation benefits do not provide for large awards meant to compensate injury victims for pain and suffering and a diminished quality of life. At The Orlow Firm, we offer a solution to this limitation in the form of potential third party claims. Third party claims often result in five-, six- and even seven-figure awards and are filed against third parties like contractors, subcontractors, vendors, delivery agents and suppliers. If you were injured on the job and need legal help, contact us. We can refer you to a highly capable workers’ compensation law firm and investigate your potential third party claim. Were you hurt at work in Brooklyn or in any of York City’s five boroughs? Contact Brooklyn workers’ compensation attorneys of The Orlow Firm at (646) 647-3398 for experienced and caring legal help. 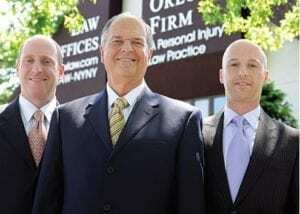 At The Orlow Firm, we have handled hundreds of workplace injury claims involving losses ranging from minor injuries to permanent disability and wrongful death. Our lawyers are in court weekly and our litigation skills serve our clients well — both in court and negotiations. Insurers know we will immediately file a lawsuit if they fail to make a reasonable offer. Our firm operates four New York City offices, making us easily accessible to Brooklyn clients. Also, we offer free initial consultations, handle cases exclusively on a contingency fee basis and can come to you if you cannot come to us. To contact us, call (646) 647-3398.